The Westin Riverwalk, San Antonio creates an unforgettable atmosphere for your Texas stay. 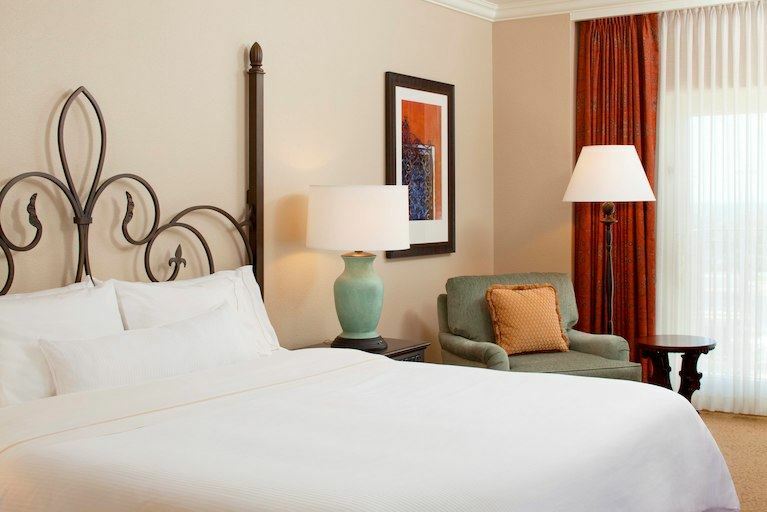 Our pet friendly, downtown hotel offers upscale hotel rooms with marble bathrooms, indulgent pillowtop mattresses, flat-screen TVs, ample desks and Wi-Fi. Many rooms enjoy balconies or terraces overlooking San Antonio or the vibrant Riverwalk. Upgrade to one of our suite accommodations to benefit from separate living and sleeping areas. Our property features a heated outdoor pool and WestinWORKOUT® Fitness Studio. The Woodhouse Day Spa® is an oasis-like spa that ensures rejuvenation. Savor authentic Italian cuisine and river views from the patio of Zocca Cuisine d’Italia or sample the delicious options at our cafe or pool bar. If you're planning an event in San Antonio, you'll appreciate our updated and versatile venues, which include two stunning ballrooms overlooking the Riverwalk. Popular attractions include landmarks like the Majestic Theatre and The Alamo as well as the Alamodome and San Antonio Zoo. The ACE Conference group rate, single or double occupancy, is $189 (not including tax, currently 16.75 percent). This rate is available until June 3, 2019, or until the block is full, whichever occurs first. Internet in guest rooms is complimentary. Reservations must be guaranteed by one night’s deposit or a major credit card. A method of payment is required when making your reservation. If you need to cancel your hotel reservation, you must do so 72 hours or more prior to arrival to avoid being charged for the first night’s room and tax. Note: If you are extending your stay either before or after the conference dates, you will need to call the hotel directly as some dates prior to June 23 or after June 26 are limited. Call 210.444.6113 and reference the ACE Conference.